LITTLE ROCK, Ark. 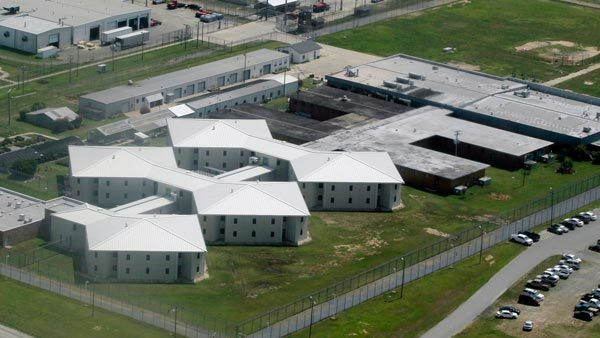 -- Six inmates snatched keys from three correctional officers at a maximum security prison in Arkansas on Monday and held the officers in an area of the facility for about three hours, the second major disturbance to occur at the penitentiary in less than a month. The Arkansas Department of Correction said the inmates overpowered the officers and took the keys during recreation call at the Maximum Security Unit in Tucker, 30 miles (48 kilometers) southeast of Little Rock. The three officers were later released with scrapes, bruises and other minor injuries, while an inmate who was not involved in the initial disturbance was taken to a hospital. Shortly after the last officer was released, corrections department spokesman Solomon Graves said the inmates surrendered and the prison began returning to normal operations. Graves said the injured inmate was in stable condition after suffering injuries that could not be treated by the prison infirmary. Graves said the inmates who had taken the keys had been moved to another facility after the incident, but did not say where. The department did not say how the prisoners took the keys from the officers, or whether the inmates had any kinds of weapons. The disturbance occurred a week after officials revealed that a guard at the same prison fired three warning shots into the air on July 22 after two guards and an inmate were attacked. The department said it was not informed of the shots fired until it was reported by the Arkansas Times. Arkansas State Police had been on standby outside the prison during Monday's incident and was waiting to enter to begin its investigation, said spokesman Bill Sadler. "Once that occurs, our agents will enter the cellblock to begin an investigation to determine and identify any criminal activity that occurred leading up to this incident and any criminal activity that may have occurred during the course of the incident," Sadler said. Graves said the department's director and the state Board of Corrections would conduct their own investigation into the incident, including whether it was related to the July 22 attack. Graves said the incident showed the risks that the state's correction officers face on a daily basis. "Today is indicative of the inherent dangers of their work, but our staff performed admirably today and at this point we are just glad that the situation was resolved without any serious injuries to inmates or to our staff," Graves said. The maximum security prison has a capacity of 532 inmates and has 295 employees, according to the Department of Correction website.